But when I’m running the Simple LoRa sketch from the Sodaq website, packets are send successfully to the TTN network. Anyone have any clue as to why the first sketch does not work? The Simple LoRa sketch is in effect a sketch for the Sodaq ONE board. Keys are OK and Gateway is in within range. Thanks for your reply. Here you go! // When you this message you are probaly out of range of the network. I don’t know the type of gateway, it’s a public one. Yeah, yeah, I know you don’t connect. Messages are passed by the gateway to TTN, where they are refused a join. Which antenna’s are you referring to? The Sodaq Explorer board has an embedded (PCB) LoRa antenna, that’s all I can find on the Sodaq website.The gateway’s antenna is unknown to me. P.S. : I leave the keys in the code/output for clarity. Will change them shortly. Just found a confusing difference in the join requests between the two sketches in the TTN Console. With the SendOTAA sketch join requests, the dev addr keeps changing. With the Simple LoRa sketch (single) join request the dev addr is the same as can be seen in the Device Overview. N.B. : in the SendOTAA sketch no dev addr is specified. However, in the Simple LoRa sketch it is specified. How often should a node do an OTAA Join, and is OTAA better than ABP? OTAA best practice: how to not join every time? 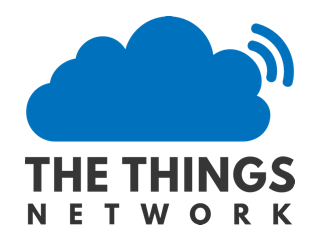 If you are not within The Things Network coverage area your device will not connect and transmit data to the The Things Network platform. and leave this page open ! now go back to the first page and there you should see the payload you send. …but I actually only read your last post, @koennetwork, so I missed that you’re getting a join error. 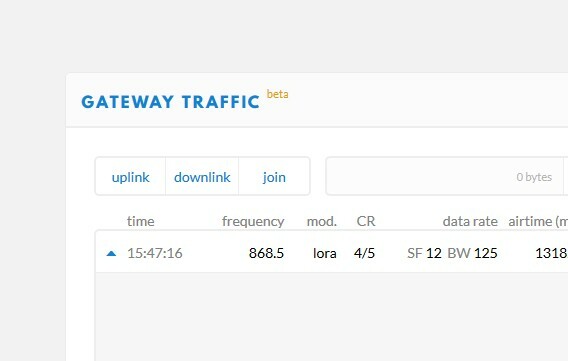 Such error should only occur for OTAA, which needs a Join Request to be received by one or more gateways, and the Join Accept to be transmitted by one gateway and received by the node. So, the numerous OTAA attempts might just be caused by the device not receiving the OTAA Join Accept for some reason. In other words: maybe the device will actually only join once, if it succeeds, in which case my previous references don’t make much sense. Messages are passed by the gateway to TTN, where they are refused a join. 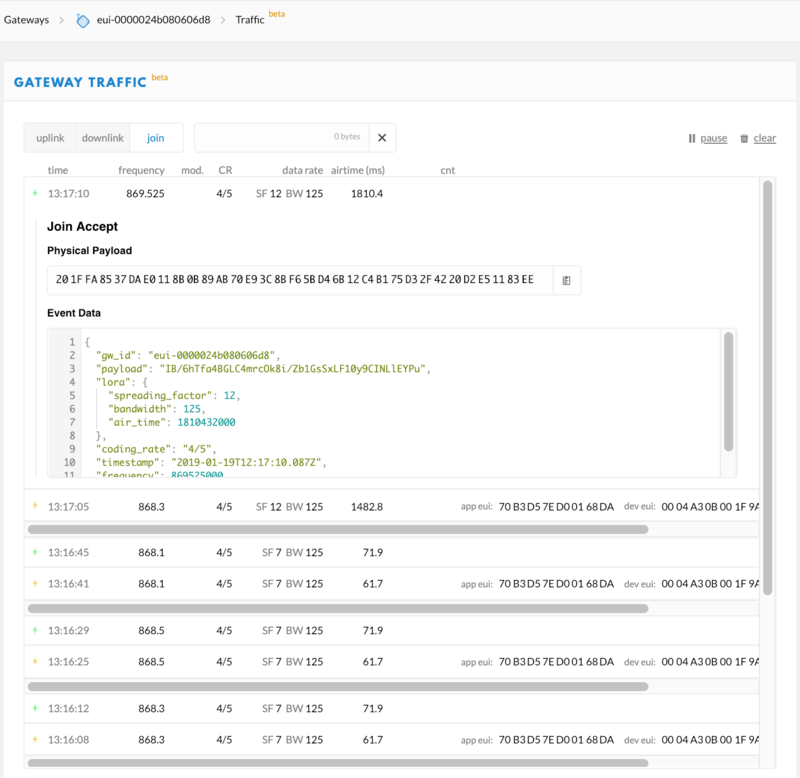 Seeing the OTAA join in the application data implies that the device has the correct settings, and that TTN accepts those. With incorrect settings, TTN would not know to which application the device belongs. So, the numerous OTAA attempts might just be caused by the device not receiving the OTAA Join Accept for some reason. But when using the Simple LoRa sketch, the OTAA join is accepted by TTN and a join response is received by the device. Furthermore, data can then be send to the TTN servers. It is my guess, that this is the cause of the problem, although I still don’t understand why the SendOTAA sketch won’t work. If you click on the join message, you might see some details about the gateway. Ah, that one is provided by Sodaq itself (and you’re using it for OTAA), but the other is based on an example provided by the Things Network, for their arduino-device-lib. For both libraries you’re seeing OTAA joins in TTN Console. OTAA works with the Sodaq library, so we know that the gateway and the settings in TTN Console seem fine. (And the Haarlem gateway is a full-blown gateway.) The keys in both sketches seem to match (the TTN library takes the DevEUI from the RN2483, but that looks good too, and as the failing join is still shown in TTN Console, TTN accepts the configuration). So the handling in the backend should be the same for both sketches, if the Join Requests are simular. Set your data rate to something other than SF12. Some RN2483 modules have issues joining on SF12. It might also help to know if the Join Accepts for both libraries are sent in RX1 (5 seconds after the Join Request) or RX2 (6 seconds), which might be different if they use a different SF. For RX1, TTN will use the same SF as the Join Request, so SF7, which somehow might not be received by the device. I also wonder if some settings in the RN2483 are configured differently for both libraries, while it seems that the TTN library does not reset it to its factory state first (at least: the log does not show that), somehow affecting its ability to receive the Join Accept? Using the Soday “LoRa Serial Passthrough” sketch you could issue sys reset, but maybe that’s really the same as a reset caused by a power cycle/programming. I added #include <Sodaq_RN2483.h> but, as expected, it made no difference. If the Sodaq_RN2483 library would have been used by the sketch and it was not included, the sketch would have thrown a compilation error. It’s indeed SF7, but the specific Haarlem gateway just got an SF12 too. I’d assume you started with the TTN library’s version? Is the SF12 the Sodaq version? then register again with different names. I’m quite sure deleting and re-registering is not needed; all is fine for one sketch, but not for the other. So as for TTN, the handling should be the same, if the Join Requests are alike. The difference must be in the Join Requests, which I think is what the gateway’s Traffic shows as well. Could be a setting in the RN2483 indeed, but not anything related to TTN Console, I think.